Neurolinguistic Psychotherapy offers a unique and exciting postmodern perspective on an advancing model of therapy. 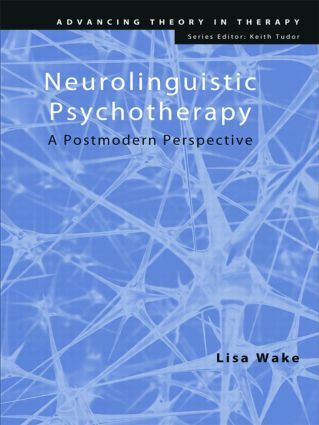 It places neurolinguistic psychotherapy in context and considers the history of NLP and its relationship to psychotherapy. Presented as an effective model for facilitating neurological change through the therapeutic relationship, this book challenges therapists to incorporate a psychodynamic approach within their work. A model of the developing personality and the relationship to attachment theory and emerging theories of neuroscience. A discussion of the linguistic components of NLP and the effectiveness of utilising the language patterns offered by NLP. A challenge to neurolinguistic psychotherapists – asking them to consider the benefits of including relational approaches to therapy above that offered by a programmatic model of change. This book will be of great interest to all psychotherapeutic practitioners and trainers, students and academics. Introduction. Founding principles of NLP. Neurolinguistic psychotherapy in context. A perspective on personality. Neurological processes. The psychology of language. Patterns of programming. Reframing internal belief structures. Therapy in practice. A postmodern approach. References. Lisa Wake is a Neurolinguistic Psychotherapist, and an internationally recognised Master Trainer of NLP. She is Director of Awaken Consulting and Training Services Ltd, which offers corporate consultancy, training, coaching and psychotherapy services. She is also Director of Awaken School of Outcome Oriented Psychotherapies Ltd, which provides UKCP accredited psychotherapy trainings. Lisa has also served as Vice Chair and Chair of UKCP.